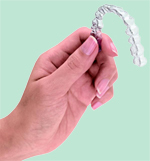 The convenience and ease of use of the Invisalign system have made it the choice of over half a million people. In fact, Inv isalign has been effective in giving hundreds of thousands of people amazing new smiles. No metal wires or bands to irritate your mouth, and best of all, most people won’t notice you’re in treatment. Invisalign®, the clear alternative to braces, has been chosen by over 490,000 people who want amazing smiles. How Invisalign can improve the health of your mouth.